Why to look for other applications for taking the video shoot from your front cam of your laptop or webcam if you can do all just using VLC media player. 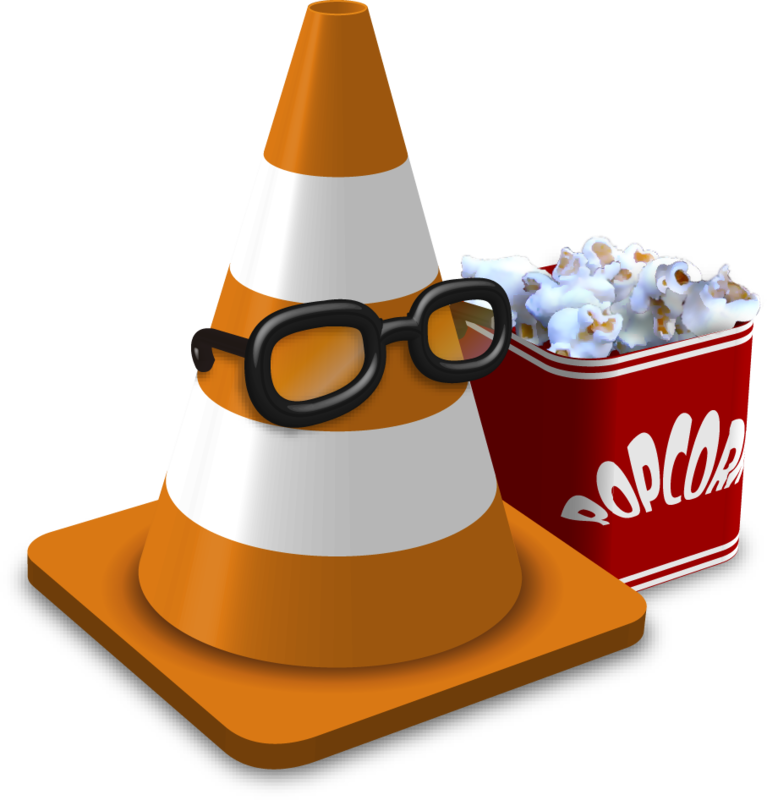 Hello everyone, I am greatly impressed by VLC media player and its ultimate power to do a lot more than any other application for video/media player. This small application is not only free and open source but also equipped with lots other features like to convert media with VLC media player but today I am also going to tell you how you can Record Video and even take the snapshot using the webcam by your VLC media player. Let’s get to started, this hardly will take 1 minute to start. Are you ready to get ahead. Your PC must have webcam with driver installed in it. New Open dialogue box will be on screen. 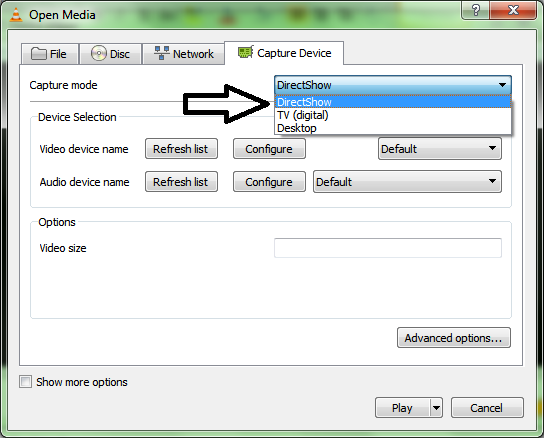 Locate the capture mode and select the Direct Show from the drop-down list. Now at the bottom of the Box, Hit Play Button and you’ll see VLC will start playing live from camera. Now you have to record the play/live show. 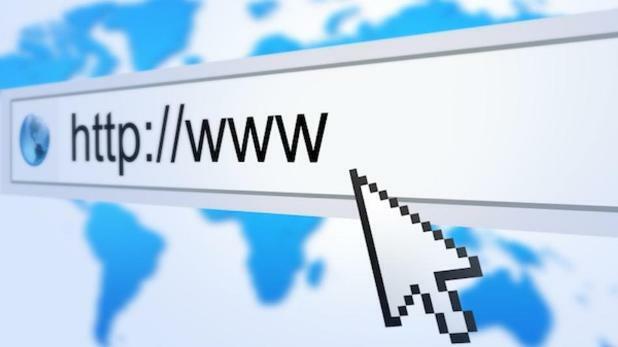 For this, Go to View > Advance control. Now you’ll notice the record button below the video above the play button. When you want to record the video, just press the record button and live/direct show from the webcam will start recording. Once you’ve done just again press the Record button again. Your recorded clip will be saved in Videos folder in library by default. 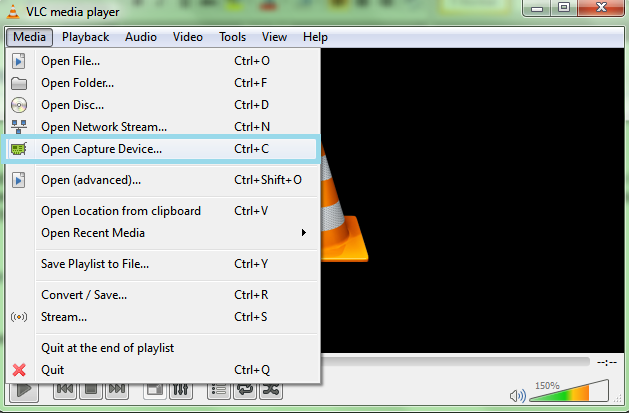 How to take photo from Webcam, using VLC media player? When VLC will start displaying live/direct video; just press [Shift] + S whenever you want to have the snapshot. All your snapshot will be saved in Library/Pictures folder. You can select from the multiple Camera or Microphone in your computer to play or record the video. Press [Ctrl]+C and the same dialogue box will appear. 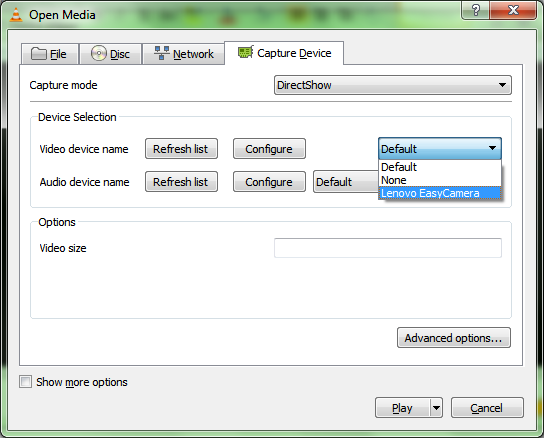 From the Video device name, from Drop down menu select the Camera name if you have multiple of them. Similarly you can select the Microphone from the Next option in Dropdown menu.